1. Make sure you are on the list in which you want to create segments/profile fields. Select the list from the "current list" panel on the left-hand side of the home screen. 2. Navigate from the home menu to Contacts. 4. Then Create New Field Group. 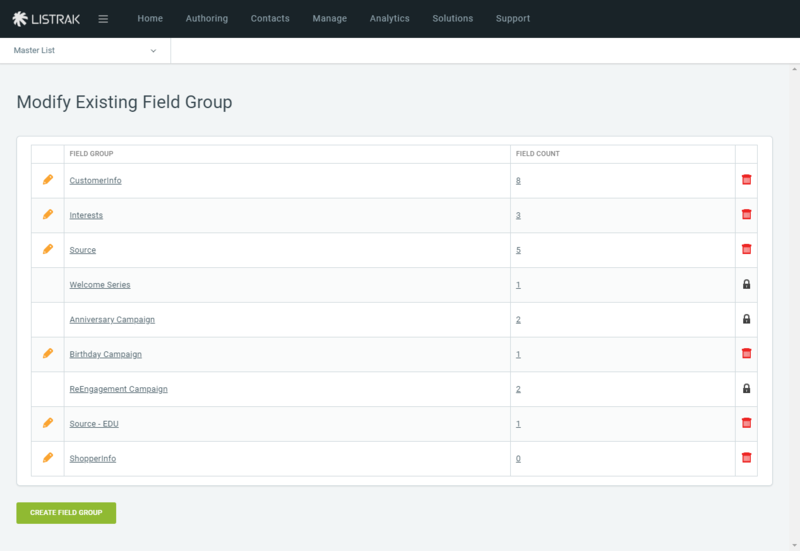 NOTE: You could access field groups that have already been set up by clicking Modify Existing Field Group. 5. Enter a Field Group Name. You also have the option to Load From Template; this means that you can save the format of field groups you've already created and chosen that format to use in creating additional field groups. Learn how to save your field groups for later use in Save Audiences for Future Use. Edit the name of the field group. Then, save the name, or choose to cancel instead. 8. Click on the underlined name of the field group you've created. 9. Here you can designate the field name, data type, and size. TIP: If you already know the fields you want to add, simply typing in the name and then hitting enter will automatically save the field you created and let you start on another field right away. 10. List out all the fields for your field group. 11. Click the save icon.